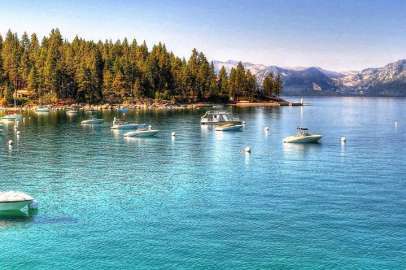 Because of their proximity to the lake, biking trails and hiking opportunities, the neighborhoods scattered just outside of Tahoe City on the west side of the lake are popular with locals and second-homeowners alike. Cathedral Forest, Pineland and Tahoe Tavern Heights are small, wooded areas with nice homes and cabins close to the highway and lake. Timberland is an older subdivision a mile south of Sunnyside with many “Old Tahoe” style cabins and some newer rustic style homes. Some homes are of “collector” quality rich in history. Quaint and rustic it is only six blocks long and two blocks wide surrounded by state and national forest and some beautiful meadows with much old growth timber in the neighborhood and surrounding forest. Timberland has its own water system and its sweet untreated water has been rated by the state as one of the best quality in Northern California. Hurricane Bay public beach is a short walk from the neighborhood. There is also a newer 8 home subdivision named Hurricane Bay Estates which features spectacular large custom homes. The most undiscovered area on the West Shore is Alpine Peaks, located four miles behind Pineland. With direct access to Alpine Meadows’ Sherwood lift and tucked away seclusion, this area is excellent for the person who wants quiet mountain living and spectacular mountain views. Although an excellent road, a 4WD in winter would be preferable. Tahoe Park is a level, easy-access area with cabins and homes in somewhat close proximity to each other. Some areas are more woodsy than others and it’s popular for the gated association beach with two piers, playground and picnic area. Talmont-Twin Peaks is a quiet subdivision on a sunny plateau above Tahoe Park and Sunnyside. This area is surrounded by forest and trails bordering Paige Meadows, a series of beautiful aspen lined meadows popular with cross country skiers and hikers. Some of the least expensive and most spectacular lakeviews are available here along with a mix of reasonably priced cabins and newer homes. This area is above lake level so it experiences more snow, but also has extensive sun exposure. Owners in the Talmont subdivision enjoy one of the best private West Shore homeowners beaches and recreation areas available at Tahoe Park. Tahoe Woods located just north of Talmont is very similar and enjoys the same Tahoe Park HOA beach and pier amenities.